Crispín D’Olot is an internationally-renowned troubadour who has recited Medieval Spanish romances and brought that Peninsula’s history and culture to life all over the world. 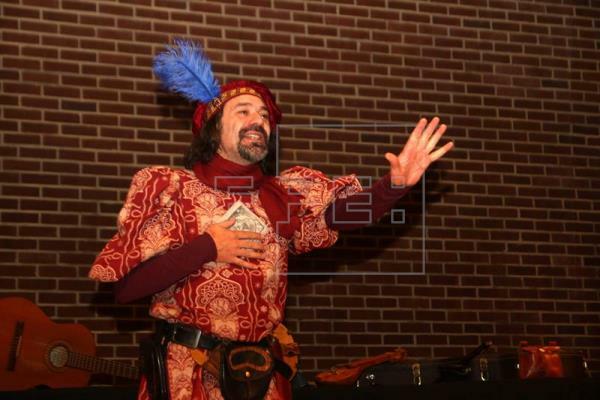 As part of the El Quixote Festival Crispín will be traveling throughout North Carolina visiting educational institutions with his one man show – “La Razon De La Sin Razon”, The Reason For The Unreason – This cultural experience offers stories, relapses, songs and poems, dedicated to the knight of the sorrowful countenance. Let yourself be swept away to that time filled with enchanting princesses,enchanted castles, knights, minstrels and troubadours. Let yourself be enthralled by the time that dreamt up the craziest and most famous knight that the centuries have ever known,Don Quixote De La Mancha, son of Don Miguel de Cervantes Saavedra. Help us celebrate 400 years of these amazing two books that many have claimed to be the best novel ever written. These events are made possible by The El Quixote Festival and the following collaborators: Frank Porter Graham Bilngüe Elementary School, Meredith College, The Rojas-Sotelo Family, UNCW DEPARTMENT OF WORLD LANGUAGES AND CULTURES, The Town Of Cary, The Triangle Philharmonic, Havana Grill of Cary, The Osuba Family and Artist Studio Project. An Academic / Cultural Event for General Education sponsored by the Department of Foreign Languages and Literatures. UNCW DEPARTMENT OF WORLD LANGUAGES AND CULTURES IS HONORED TO BE A PART OF THE EL QUIXOTE FESTIVAL. WE ARE DELIGHTED TO COLLABORATE WITH ARTIST STUDIO PROJECT IN CELEBRATING 400 YEARS OF CERVANTES AND DON QUIXOTE. WE ARE PROUD TO BE ONE OF THE PLACES HOSTING DIRECTLY FROM LEON SPAIN, INTERNATIONAL SENSATION CRISPIN D’OLOT AT OR UNIVERSITY ON MARCH 1, 2015 AND INVITE THE COMMUNITY TO CELEBRATE WITH US THIS HISTORIC AND IMPORTANT FESTIVAL! THE TOWN OF CARY IS HONORED TO BE A PART OF THE EL QUIXOTE FESTIVAL. WE ARE DELIGHTED TO COLLABORATE WITH THE PHILHARMONIC ASSOCIATION AND ARTIST STUDIO PROJECT IN CELEBRATING 400 YEARS OF CERVANTES AND DON QUIXOTE. WE ARE EXCITED TO HOST DIRECTLY FROM LEON SPAIN, INTERNATIONAL SENSATION CRISPIN D’OLOT AND INVITE THE COMMUNITY TO CELEBRATE WITH US THIS HISTORIC AND IMPORTANT FESTIVAL! BY THE TRIANGLE YOUTH PHILHARMONIC. MARCH 5TH, 2016 AT 7PM A MEET AND GREET RECEPTION TO FOLLOW. SPACE IS LIMITED PLEASE PURCHASE TICKETS NOW. BELOW ARE A FEW OF HIS PAST PRESENTATIONS. We Are Super Excited That The Triangle Youth Philharmonic is Collaborating once again with the Telemann’s Don Quixote Suite. Below is just a little taste. “Attack on the windmills”. 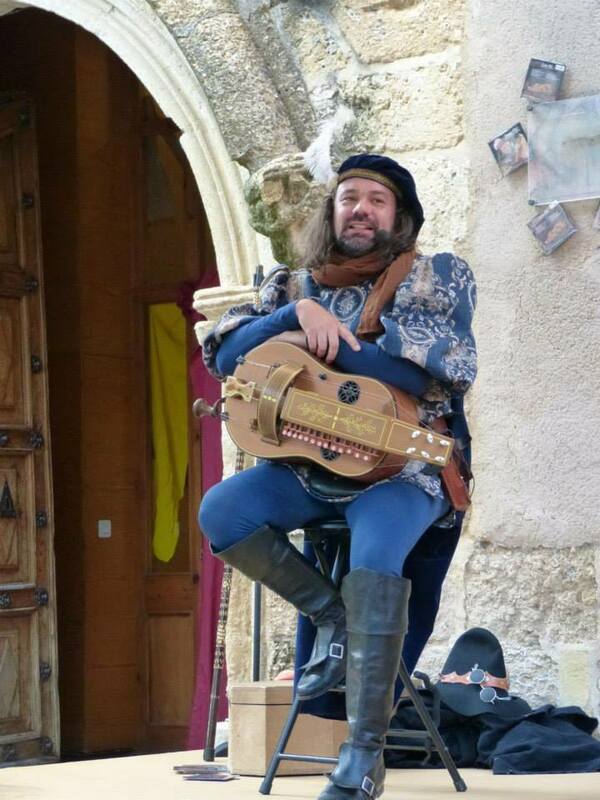 Minstrel trobadour or troubadour minstrel because in these times as in times gone by we really don’t know where the one begins and the other ends. 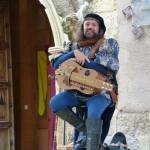 Fifteen years ago Crispin d’Olot, old-fashioned troubadour, started performing in theaters, schools and places of Spain, Europe and Latin America. This theatrical, poetic and musical adventure was a response which this literary “jongleur” found utilizing classical literature as a tool to reconstruct cultural imaginary essential to a society increasingly marked by violence and the inability to meet on common points of identity and values. Currently Crispin d’Olot is considered a necessary cultural reference, he has been blessed with great successes on television especially prime time where the format has helped him promote his artistic quality. Trovador juglaresco o juglar trovadoresco porque en estos tiempos como en los pretéritos no se sabe muy bien donde empieza lo uno y acaba lo otro. 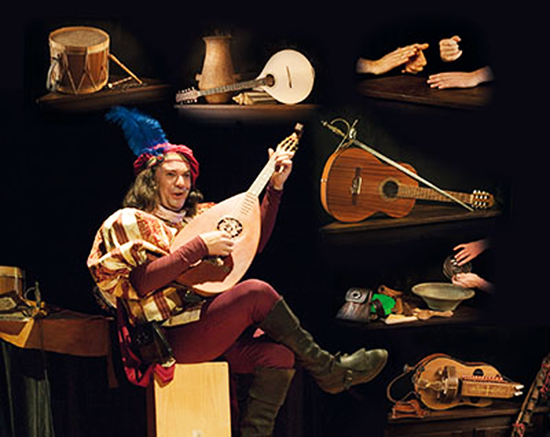 Hace quince años que Crispín d’Olot, trovador a la vieja usanza, viene representado por teatros, escuelas y plazas de España, Europa y América Latina. Esta aventura teatral, poética y musical, nació como respuesta del último juglar literario -que encontró en la literatura clásica una herramienta de cultura para reconstruir imaginarios que permiten el rescate de nuestra esencia- a una sociedad cada vez más marcada por la violencia y la incapacidad para reunirse en torno a puntos comunes de identidad y valores.En la actualidad Crispín d’Olot es considerado un referente cultural obligado, llegando incluso a cosechar grandes éxitos en programas de televisión de máxima audiencia por su poder de convocatoria y la calidad artística y nivel de producción.